Looking for ideas for my weekly Metro Now column on the foibles of mankind, I saw a feature story about how increasing numbers of Indian men want their brides to be like the women they see on TV soaps. Apparently, in matrimonial ads around the country, eager young bachelors are putting in specifications that read: “She should be like Tulsi in Kyunki Saas Bhi Kabhi Bahu Thi or Saloni in Saat Phere” (this is of course in addition to the usual “traditional yet modern, fair but homely, virgin yet whore” litany). – Her range of facial expressions must include Pursed-Lip Discontentment (when the saas-ji is praising another daughter-in-law), Simpering Complicity (the innocent girl being bullied around by more dominant family members), Evil-Vixen Smirk (when a nasty plot has succeeded) and Frantic Eye-Roll (when a plot is being unmasked). – She must wear twice her own weight in jewellery at all times, even in the kitchen and the bedroom. Laden with family heirlooms passed down over 20 generations (most of whom are still living characters on the show), arms covered with gleaming bangles, she should resemble the robot in Metropolis, or at least an extra from a 1950s cult sci-fi movie. This means that in addition to carrying cups of tea hither and thither on trays, she can double up as a security guard: if a burglar enters the house, all she has to do is stun him senseless with the reflective glare from her 7,000-carat necklace. – She should be able to walk in slow-motion, like the heroines (and all other characters, for that matter) of these shows. There are two reasons why everyone on a daily soap must walk in slow motion. First, because it creates a Dramatic Effect (though people with IQs above 8 might disagree with this idea), and second, because when a new episode has to be produced every day, you need to stretch things out. It would be too much to expect the poor writers to actually work on a 25-minute script daily (what are they, bloggers? ), so other dramatic devices must be used. Thus, whenever a character says anything spectacular on a soap (and of course, these people only ever say spectacular things; you'll never hear an uncomplicated "saaso-ji, pass the garlic prawns please"), it will be said in a room containing 20 others, and we will be shown elaborate reaction shots of each of these people (Evil-Vixen Smirk, Frantic Eye-Roll, etc). Or a reaction shot of a single person replayed five times, with the camera twirling drunkenly around the room, and thunder-claps on the soundtrack. This is an efficient way of prolonging a five-minute scene for a week and thus cutting down on extraneous costs (because all the money must go on the really important things – the clothes, hairstyles and bangles). Come to think of it, maybe the new lot of bride-seekers have the right idea. If we all modeled our family lives on daily soaps, world problems would end immediately – everyone would be too busy simpering at each other in slow motion to worry about the big issues. P.S. This business of slow-motion brings me to some general observations about the Indian daily soap, which differs markedly from its western equivalent. In the US too, daytime soap operas are generally regarded as the nadir of human achievement, but if you go beyond knee-jerk snobbery it’s possible to appreciate the professionalism with which they are made. For instance, key roles are usually played by actors with some experience in theatre (even if it isn’t Grade-A theatre), each scene is rehearsed as a scene in a play would be, and then shot in a continuous take, with the action simultaneously captured from different angles so that the footage can later be edited for maximum dramatic effect. P.P.S. One of the many things you don’t know about me is that I’m something of an expert on the history of American daytime television, so expect more posts of this sort. 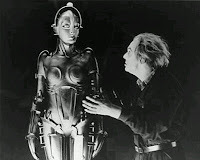 I resent your dragging Metropolis into this. That robot is alive! (not to mention totally hot). Which is more than I can say for all these other women. how you wrong the tv industry! when a good half of every episode is made up of recaps of the previous three episodes, where's the time to walk in slow motion?! When these young men do find these Tulsi and whomever else, do they come complete with a kit for making sound effects, with the face of the same person appearing thrice or more times, when he/ she (well, usually she) is responding to something with anger, shock, horror or shock-horror? Well, I've believed for a long time that most of the minor roles in these soaps are created only so they can have enough faces to show in reaction shots. Just the heroine and the scheming evil woman and the hapless mother-in-law would get a bit boring no. Come to think of it, just imagine how many actors are earning a more than decent living out of raising their eyebrows and looking shocked! By the way, yeh-desh-ke-ujjwal-bhavishya, hamare naujawan itna daytime TV kyon dekh rahe hain? Aur woh bhi saas-bhi-kabhi-bahu-thi? Do they not have jobs to go to, or do they all work in call centres in night shifts? Has anyone seen mallu soaps? They are interesting. Not because they aren't maudlin and often silly in the same ways, but they do weird stuff with the camera. The aforementioned prospective bride MUST apply globs of makeup and at least 20 pounds of saris before the husband and wife retire to bed. They also can't go to the bathroom. EVER. So the robot should be perfect. And then there are those startling reaction shots done in negatives or X-rays or something.. do they use that when they exhaust the repository? Or to save on makeup costs? Heh. Well, if we're so smart and they're so stupid, how come they're the rich ones? How much more anti-social and unpatriotic can you get!!!! I mean, look at EK's soaps, aint it providing a living to so many of its artists (if i can dare to call them that without offending the real ones!!!). Why do you want so many people to become jobless and add to our unemployment rate. And this job is atleast better than the money exchanger one!! I wonder if everyone hates these serials so much, how do they manage such high TRPs??? "Or a reaction shot of a single person replayed five times, with the camera twirling drunkenly around the room, and thunder-claps on the soundtrack." and hey, you forgot about the extra-marital affairs. The bride-to-be must be open to her husband having an extra-marital affair and probably have a kid or two from the relationship. Well, she should be ready to have one too!! That robot is alive! (not to mention totally hot). Falstaff: I agree. This is probably why we spend so much of our time in water tanks. Space Bar: Are you trying to say the recaps are played in normal time? Neeti: freelancer. Write in quite a few places, but most of the stuff I'm satisfied with is on the blog. Shefaly: I want that kit! So this is how the stories work. At the beginning of the week a schedule is made which actor is available and which is one is leaving. According to that the writers are directed to write the story. In case somebody is leaving the serial, he has to be dead(until EK hunts for a replacement). And then a plastic surgery is conducted to get the person back. You also forget to mention the contact lens angle. Cattier the lens vampier the charecter. Do they have a place in the Indian man's fantasy? Maybe in the kinkier types. Ekta Kapoor is the culprit. Lets draw hang and whatever her for the trash she perpetuates. To Arthur Quiller Couch's ques - who says we are smart. We(the audience) lap up all that EK dishes out.Shes the smart one. There's a popular theory that the script writers (such as they are) go from episode to episode, plotting possible plot lines against complexity. At each decision node, the most complex plot possible is chosen, and so on, ad infinitum (which, as we all know, is how long a single day can last on an EK soap). hahaha oh man this great! i couldnt agree more about the angles and thunder claps, my grandma has these shows on 24/7 and i get dizzy just watching one scene! "I’m something of an expert on the history of American daytime television, so expect more posts of this sort." Waiting for these posts badly, Jai!